Not all wide-format printing systems are created equal. Take a peek under the hood and you will see that Océ units are radically different than anything else out there...and we should know. We have championed Océ systems for over 20 years. Discover how an Océ wide-format unit can take your workflow to new levels. The versatile and flexible ColorWave 3000 Series all-in-one large format system performs equally well with specialty media graphics as it does with CAD and GIS prints. Prints that are produced quickly and come out instantly dry with the patented Toner Pearl CrystalPoint technology. 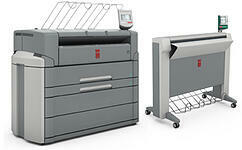 A dynamic large-format system for both full-color and black/white functionality. Patented Océ TonerPearls ensure robust, waterfast, prints every time. The Oce ColorWave 500 fits perfectly into CAD and GIS environments with color demands. The Océ PlotWave 450/550 is a revolutionary, single-footprint wide format plotter is capable of quickly producing D-Size sheets at 1200 x 600 dpi. Color scanning is integrated via Océ Scanner Express II (CIS scanner). The Océ Clear Connect user interface lets you easily navigate the advanced functions through the full-color tablet-like interface. The Océ PlotWave 750 wide format plotter is capable of producing over 9.5 D-Size sheets per minute at 1200 x 600 dpi. Color scanning via the TC-4 scanner. This new upgraded version is built on the success of the previous TDS750, but host a new array of upgrades including advanced networking and security. 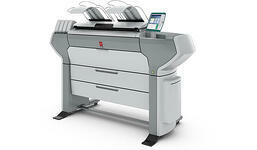 Print the way you want with the new Océ PlotWave 365 multifunction system. 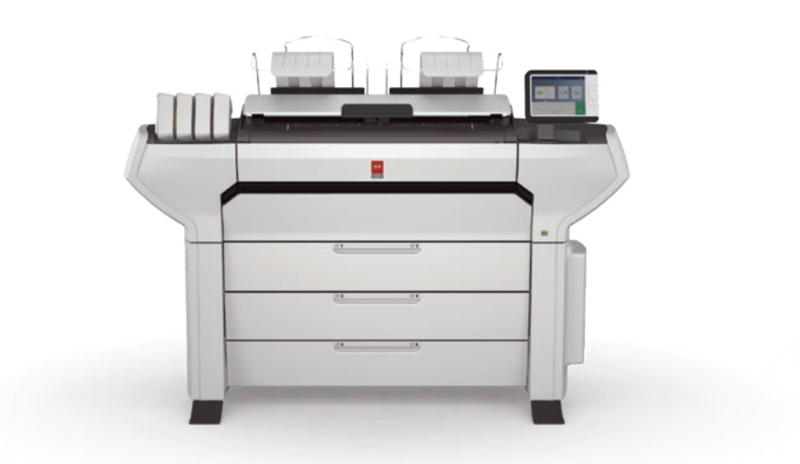 It is built on the award-winning success of the Océ PlotWave printer but much more powerful. The PlotWave 365 sets the benchmark for lower volume LED wide-format systems. Plotting, copying, and scanning large format technical documents just got easier for everyone. The next wave of Océ monochrome multifunction systems starts with the Océ Plotwave 345 system. It cuts energy usage in half and fits into small spaces. Have questions? Contact one of our Océ wide-format equipment specialists.